Residential development site sale volumes are up 68 per cent with 39 per cent sold to foreign developers. Annual capital growth for apartments was recorded at 13.3 per cent, which was the highest since 2001. Key transport infrastructure projects underway with a large pipeline proposed out to 2023. Low interest rates sustained over the past 18 months have fuelled investment in the Sydney apartment market, leading to an increase in dwelling approvals, sales volume and housing finance in 2014. According to the latest research from Knight Frank, the growth in apartment values in metropolitan Sydney has now reached a height not seen since 2001, whilst low vacancy has remained, despite a significant number of new supply projects coming on line as rents continue to trend upwards. At the same time, Sydney was ranked the seventh most liveable city in the world, where the Economist Intelligence Unit considers the city’s stability, healthcare, culture and environment, education and infrastructure when grading the Global Liveability Index. Coupled with a ranking of third for quality of life in the latest Knight Frank Global Cities Survey, it is not surprising that population in Sydney is positively projected. According to Knight Frank’s Associate Director Michelle Ciesielski, Residential Research, in the 12 months to August 2014, sales of major sites likely for high-density development in the Sydney metropolitan area totalled $2.7 billion. “This was up 68 per cent on the previous year, as inner city sites become scarce. Foreign developers purchased 39 per cent of the sites with countries represented including China, Malaysia and Singapore,” she said. 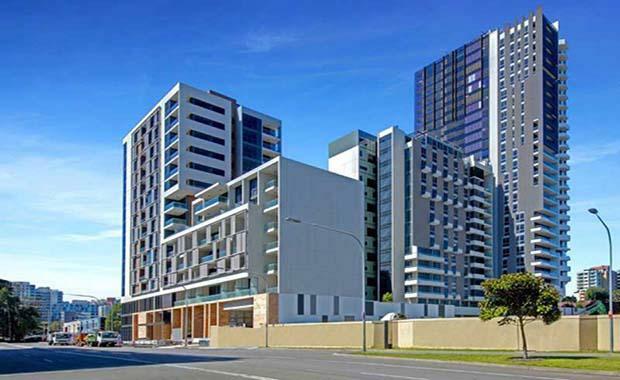 Meriton dominated the local purchasers with sites including the former DEXUS Business Park in Rosebery for $190 million and a Sydney CBD office building planned for residential conversion at 234 Sussex Street for $60 million. “Across the Sydney metropolitan area, sites are averaging $132,000 per apartment. The CBD and South region average $173,000 per apartment with recent sales achieving close to the North average of $248,000. Whilst the North West averaged closer to $105,000 per apartment, some sales recorded close to $140,000,” said Ms Ciesielski. Over the past 10 years, according to Rawlinsons, cost of construction has increased circa 4.5 per cent per annum, with a standard multi-storey apartment complex now costing on average $2,015 square metre for a basic finish. A prime finish would be closer to an average of $3,010 a square metre. Ms Ciesielski said growth in Sydney’s apartment values has now reached a height not seen in metropolitan Sydney in 13 years. “In the 12 months to June 2014, capital growth was achieved at 13.3 per cent. Last quarter has sustained this rate, at 3.5 per cent with the last month realising growth of 1.2 per cent. “Sales turnover increased 29 per cent over the past year to 47,952 apartments; currently the highest volume across Australia. The CBD and South region has the highest median values in Sydney, at $688,500, closely followed by the North region at $676,000. Median values in the Sydney CBD were $659,500 in June 2014,” she continued. New, high quality apartments in well positioned locations can achieve an average of $25,000 -$30,000 square metre in the Sydney CBD. According to Andrew Drury, Knight Frank’s Director, NSW Project Marketing, vacancy in Sydney has trended well below the market equilibrium of three per cent since October 2012. Mr Drury said the market is readily accepting studios and one bedroom apartments without parking, as affordability and access to public transport become the main drivers for both owner occupiers and investors. “50 per cent of investors in a number of Knight Frank’s recent developments (including Lilybelle in Waterloo, Camperdown HQ and Edge in Ultimo), have been Self-Managed Super Funds; mums and dads helping their children, or first home buyers looking for investment opportunities below the $750,000 price point to benefit from stamp duty relief and the first home buyers grant,” he continued. A positive outlook is forecast for the NSW economy, largely driven by a solid pipeline of residential construction and increased state government expenditure on a number of key infrastructure projects, which will present future opportunities for local and foreign developers. Capital value growth is unlikely to be sustained at current levels over the medium term, however with interest rates anticipated to remain at current levels into mid to late 2015 and with strong population growth; it is likely that growth in values will be experienced in the short term.